The 2019 New York Auto Show is right around the corner and Infiniti is giving us a taste of things to come by previewing the Q50 Signature Edition. Debuting next week in the Big Apple, the special version combines a lot of standard equipment with some subtle exterior styling revisions to make it worth your hard-earned money. Visual tweaks include slightly sportier front and rear fascias along with 19-inch wheels you won’t be finding on any other Q50 variant. Rounding off the changes on the outside is the bespoke badging on the trunk lid. The real magic happens inside where Infiniti has crammed a lot of kit. For example, the ProAssist Package is included, which means the Q50 Signature Edition comes with blind spot warning, front + rear sonar system, and the Around View Mirror (with Moving Object Detection). Also part of the same package is the Rear Cross Traffic Alert combined with Backup Collision Intervention. Another package bundled with the special-edition sedan is the Essential Package, adding goodies like heated front seats and a heated steering wheel. The remote engine start is part of the deal, as is the company’s InTouch infotainment system with 3D view, lane guidance, and voice recognition for the navigation. Infiniti will be selling its special-edition BMW 3 Series rival exclusively with a rear-wheel-drive layout and the twin-turbo 3.0-liter V6 engine developing 300 horsepower and 295 pound-feet (400 Newton-meters) of torque. You’ll find the Q50 Signature Edition at an Infiniti dealer in the United States next month, but bear in mind production is going to be limited. Nissan’s premium brand doesn’t specify how many cars will be made, but we do know these will be available with a choice of five paints: Black Obsidian, Graphite Shadow, Liquid Platinum, Pure White, and Iridium Blue. While the Q50 Signature Edition will be in New York, Infiniti will have a different premiere next week by introducing the electric Qs Inspiration sedan concept at the Auto Shanghai in China. INFINITI's 30th anniversary celebration continues as the brand honors its past, present and future during the 2019 New York International Auto Show. INFINITI introduces 2019 Q50 Signature Edition with added luxury exterior treatments and standard driver assistance features designed to empower the driver. Also on display at the INFINITI stand will be the Q Inspiration concept, which previews a new generation of INFINITI sedans. NEW YORK – As INFINITI continues to celebrate its 30th anniversary during the New York International Auto Show, the automaker honors its heritage as well as its current lineup as it signals the possibilities for design and technology for future vehicles. INFINITI will debut the new 2019 Q50 Signature Edition – which offers the sedan's most popular features combined with unique exterior finishes – as well as the INFINITI Q Inspiration concept. 'The sedan segment is still very much an important part of the industry, and the INFINITI Q Inspiration concept was created to breathe new life into this market," said Mike Colleran, global division vice president, Marketing and Sales Operations. 'By exploring the bold and unconventional, the Q Inspiration concept showcases a new design language for the era of electrification and signals what the future holds for the INFINITI brand." In addition to the 2019 Q50 Signature Edition and the Q Inspiration concept, INFINITI will also display its full model lineup, including the latest SUVs, the INFINITI QX50 and QX80. Taking its popular sports sedan to an even higher level of sophistication, INFINITI brings together a range of highly desired features in the new 2019 Q50 Signature Edition, combining the elegant design with the robust performance of the INFINITI Q50. 'Since INFINITI Motor Company launched 30 years ago, our primary goal was to deliver a truly luxury experience with every moment spent behind the wheel," said Tim Franklin, director, INFINITI Product Planning. 'The 2019 Q50 Signature Edition highlights this focus as we combine the award-winning VR-series engine with unique design details and our most popular features into one package." The Q50 Signature Edition strikes an ideal balance of performance and luxury, starting with the company's award-winning 300-horsepower VR-series 3.0-liter V6 twin-turbo engine under the hood. Unique exterior treatments include sport design front and rear fascias, special Signature Edition trunk badging, and exclusive 19-inch bright-finish Signature Edition alloy wheels. Interior appointments for the 2019 Q50 Signature Edition include Kacchu aluminum trim and leather-appointed sport seats. Standard on this model are a suite of features typically offered through the ProASSIST Package, including Blind Spot Warning, Around View® Mirror with Moving Object Detection, front and rear sonar system, Rear Cross Traffic Alert and Backup Collision Intervention. Also included as standard on the 2019 Q50 Signature Edition are features typically offered as part of the Essential Package, including heated front seats and steering wheel, remote engine start, INFINITI InTouch™ Navigation with Lane Guidance and 3D building graphics; INFINITI InTouch™ Services with voice recognition for navigation functions, including one-shot voice destination entry and SiriusXM® Traffic™ with four-year complimentary trial access to real-time traffic information. The 2019 Q50 Signature Edition will be available in five colors: Black Obsidian, Graphite Shadow, Liquid Platinum, Pure White and Iridium Blue. 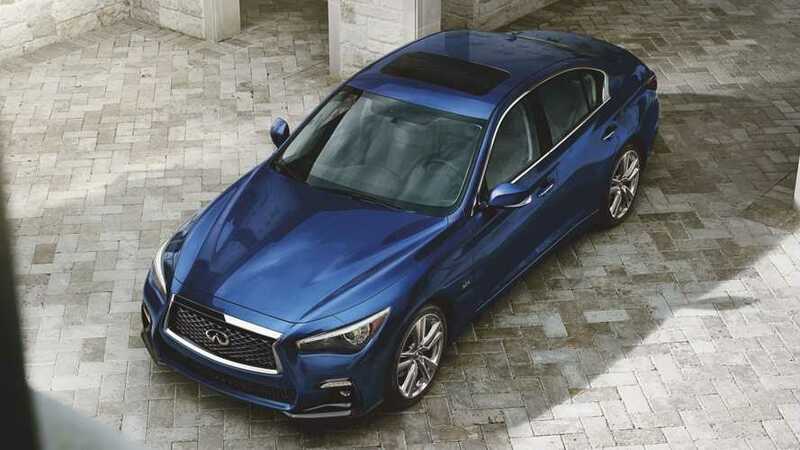 Production of the 2019 INFINITI Q50 Signature Edition vehicles will be limited, and this model will be available at INFINITI retailers in May 2019. Also on display at the INFINITI stand will be the Q Inspiration concept, which previews a new generation of INFINITI sedans that will offer a whole new level of electrified driving performance as an evolution of INFINITI's current powertrains. The exterior of the INFINITI Q Inspiration concept features dynamic and confident proportions, and it is the first manifestation of INFINITI's new form language for an era of advanced powertrains and autonomous technologies. The interior follows this minimalist approach with a concise and clean interior design wrapping the driver and passengers in a serene, spacious and comfortable environment. The INFINITI Q Inspiration concept – indicating the future of INFINITI sedans – was the first of several concepts that give a glimpse into the future design of INFINITI's entire family of vehicles. The Qs Inspiration, debuted at 2019 Auto Shanghai, previews the new design language for future INFINITI sports sedans. QX Inspiration concept, introduced earlier this year at the 2019 North American International Auto Show, hints at the electrified future of INFINITI SUVs. In addition to the Q50 Signature Edition and the Q Inspiration concept, INFINITI will also showcase its current offering of world's first driving technologies and daring design with its full model lineup. Representing INFINITI's sedans and coupe are the Q50 Signature Edition and Q50 RED SPORT 400, the Q60 RED SPORT 400 and the Q70L. The Q50 RED SPORT 400 and Q60 RED SPORT 400 are the pinnacles of performance for INFINITI's sports sedan and coupe offerings, delivering 400 horsepower at 6,400 rpm – the most standard horsepower for any non-specialty model – and torque is rated at 350 lb-ft at 1,600-5,200 rpm. The 2019 INFINITI Q70 and Q70L (long wheelbase) performance luxury sedans bring together unparalleled levels of style, performance, luxury, craftsmanship and technology. From INFINITI's SUV line are the QX50, QX60 and QX80. The 2019 QX50, INFINITI's most advanced vehicle to date and embodies everything INFINITI stands for: beautiful design, advanced technology and empowering performance features. The luxury mid-size crossover features the world's first production-ready variable compression engine, the VC-Turbo, which provides the power and strength of a sprinter with the efficiency and endurance of a marathon runner. The popular and highly awarded INFINITI QX60 offers the best of both luxury and practicality with a combination of family-oriented features as well as a welcoming, carefully crafted design inside and out. Finally, the flagship of INFINITI's SUV lineup, the QX80 boasts a refined, spacious cabin that features high-quality materials, a handcrafted finish and advanced drive-assist technologies. The New York International Auto Show runs from April 19 through 28 at the Jacob Javits Convention Center. More information on the 2019 Q50 Signature Edition, as well as INFINITI's entire lineup, is available at www.infinitiusa.com.